I've been seeing a lot of swamp coolers on electric appliances stores and DIY hardware shops being sold. They are also becoming popular on open air restaurants. But what is this swamp cooler thing? Swamp coolers , similar to air conditioners, were invented to turn hot air into cool, the science behind each method is quite different. 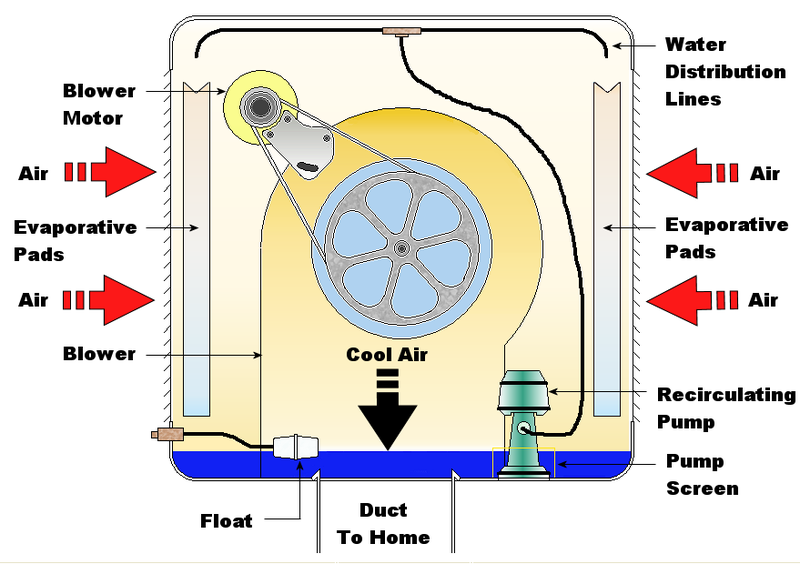 An evaporative cooler (also swamp cooler, desert cooler, and wet air cooler) is a device that cools air through the simple evaporation of water. 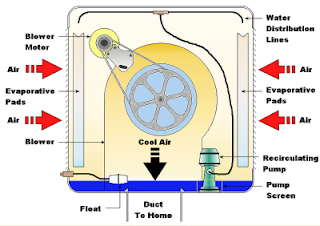 Evaporative cooling differs from air conditioning by refrigeration and absorptive refrigeration, which use vapor-compression or absorption refrigeration cycles. Basically, before buying swamp coolers, you should understand first how it works. As described above , the air must be dry and hot for this coolers to be effective. When humidity of air is high, swamp coolers won't even lower the temperature by 1 degree Celsius. Swamp coolers are suited on countries like Africa, Saudi, Australia, India, Mexico and Hawaii. So should you buy a swamp cooler? If you have plenty of money then buy one, you might be able to use it on some occassion when the temperature is hot and the air is dry. But if you want to spend your money effectively, don't buy one. You won't be able to use it most of the time. Its better to spend the money by adding it on your budget for aircon then buy an inverter type. Inverter type air-con consumes almost 50% less electricity. 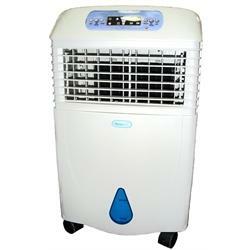 or better yet, use swamp cooler in tandem with air conditioners for optimal temperature and humidity on your room. Just don't blame me if your electric bill (just like mine) goes sky high. I really like this. I found this online that, Heat And Cool, Americans NUMBER 1 Online HVAC store, Free Shipping & 50%OFF on select products Klimaire Central Ducted Systems. You can rest assured that as a customer of Heat And Cool you are receiving the best prices,support, and products. Actually I'm not yet sure if DrKeithCurrie is really a spammer, i check the website and it's not some kind of virus infested or whatever type of website. I'm just thinking that he's one of the people who are paid to advertise using blogs comments system. Korek, he is most likely someone having an interest to promote that site. But the fact that his message doesn't have any refer to your article text (what a comment should be after all), being just an advertising text with a direct link to that store, without anyone asking for, kind of qualifies it for the title of spammer, huh ? Anyway going back to the topic. From what country are you from, are you also using swamp coolers their? I've been researching for this cause , as posted above, their are plenty of these coolers on sale here in Phil. What confuses me is if the seller knows that the coolers will not be effective here and why are they still selling. I'm from Eastern Europe and because we have a continental climate over here, we don't use so much air conditioning at home (but you can still find it in public/commercial buildings). That's why I'm also not so familiar with air conditioning systems (never heard of a swamp cooler till now). I don't even have an electrical fan at home, lol, even though these past weeks was so hot here too that i seriously considered buying one. You're one lucky guy. If ever you experience staying here in Manila,Philippines you'll realize your very lucky. Though there are places in the country that has comfortable climate such as tagaytay,cavite or baguio city. One of the highest contributor to our electric bill is climate control. I know what you mean, you have some nasty weather over there (even though i really love sun and warmth) especially because the humidity in the air is so high and the body can't sweat enough, making the high temperatures even harder to tolerate. Never thought you know some of the filipino words. I'm starting to like you. Salamat po. I like what you are doing here too, that's why i check your blog from time to time. Even if it's not always about the N8, hehe, you touch interesting subjects. BTW, I had an attempt to visit Tagaytay sometime ago, but the economical crisis that hit a bit my bizz made me postpone the trip. Thank you also for appreciating my blog. I'm still consolidating information for N8. As far as my research have reached, latest news only concerns preview etc etc which have been posted already before and has no significant change since then. As for tagaytay, you should definitely visit that place. You must try their "kapeng barako" (a type of brewed coffee from batanggas) and bulalo (i dont know the english equivalent). We shouldn't have to wait too much till N8's launch. The end of Q3 is close and i think we will see some "proper" reviews of N8 in 2-3 weeks max. Thanks for the Tagaytay tips, will definitely try them when I'm there.